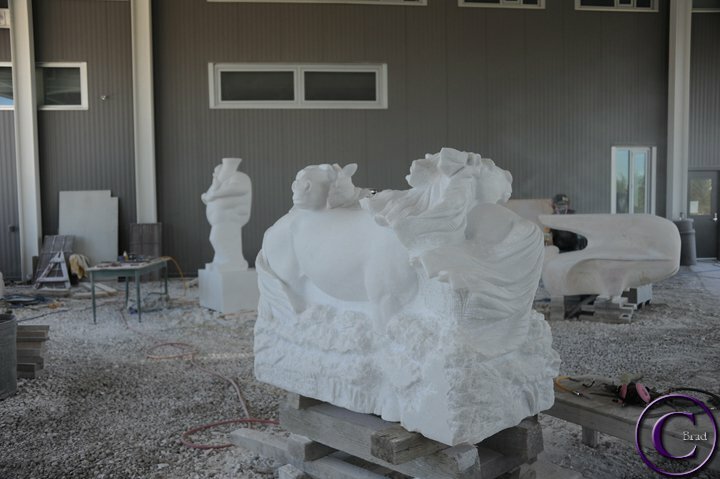 This is a view of one area of the park, in the forground is "Desire to Be" in marble by Gerard Motondi of Kenya. 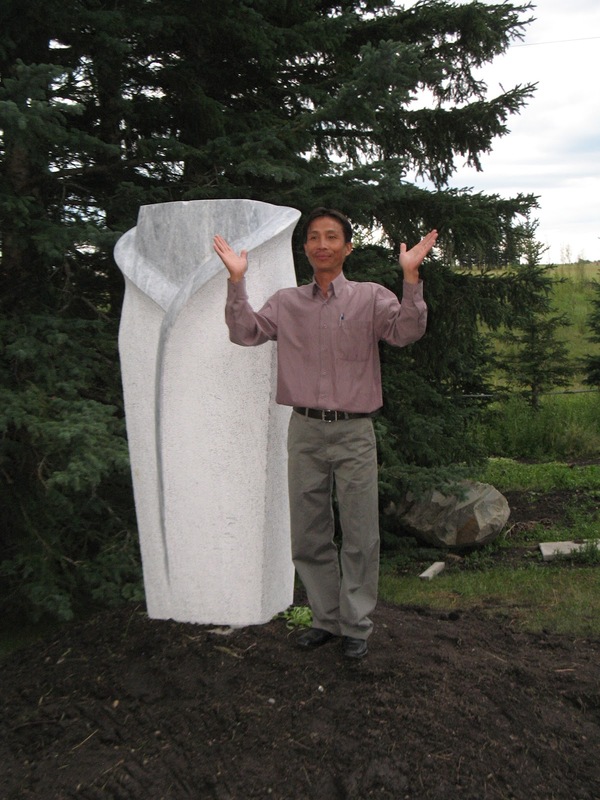 Gerard was the gold medal winner at the 2008 Beijing Sculpture Olympics, it is wonderful that we are able to see original works of this great artist and others right here in our own back yard. Also pictured are "Prelude"- Carlos Valezquez (Cuba), "Movement in Space"- Peerapong Dongkeaw (Thailand), "Reflection"- Tanja Roeder (Germany), "Maintain" Nguyen Tan Cuong (Viet Nam), "The Gates to Heaven, Everybody can go" - Chander Parkash (India) and "Ying and Yang" Tran Viet Hung (Viet Nam). 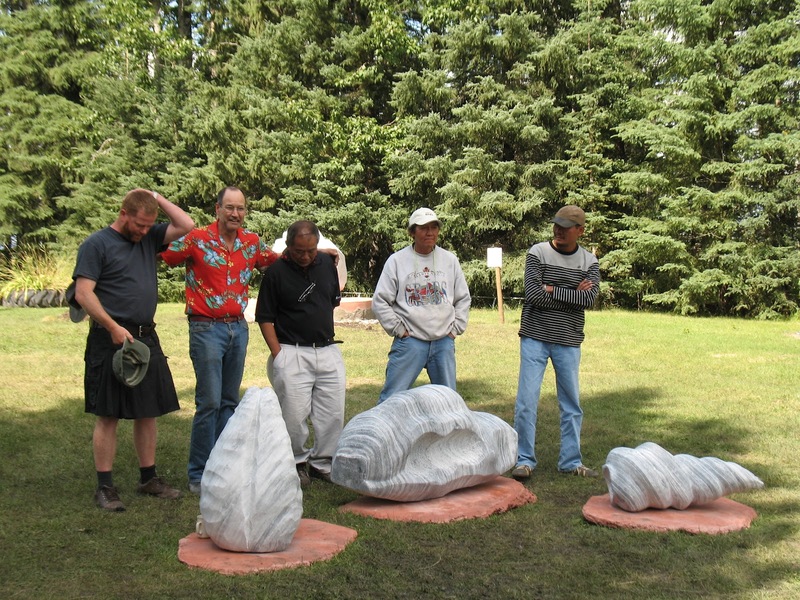 These and 12 other monumental stone sculptures are nicely displayed at the sculpture park, open daily from 10am - 5pm. 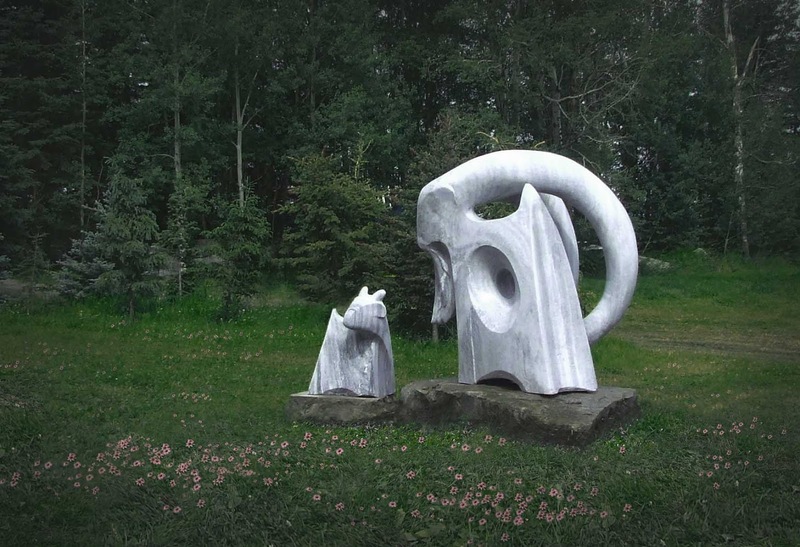 When you are in the Sundre area a trip to the Bergen Sculpture Park is well worth making. Young and old alike will appreciate this wonderful collection of international art in a beautiful country setting. Admission $2 per person. Below are photos of all of the suclptures along with some information about each of them. 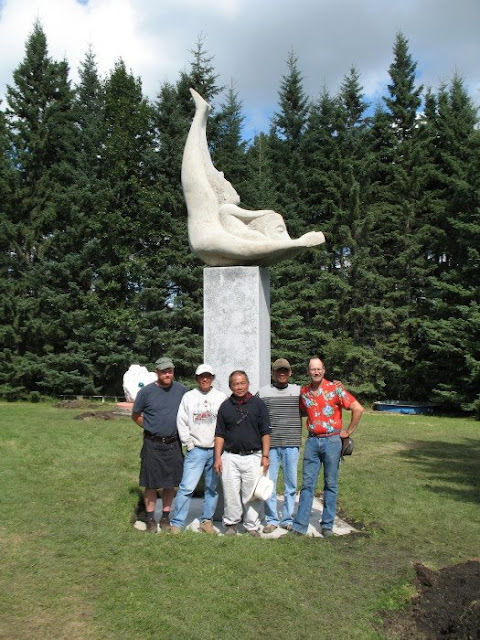 Peerapong's sculpture depicts a man diving through the air with a baby on his back. 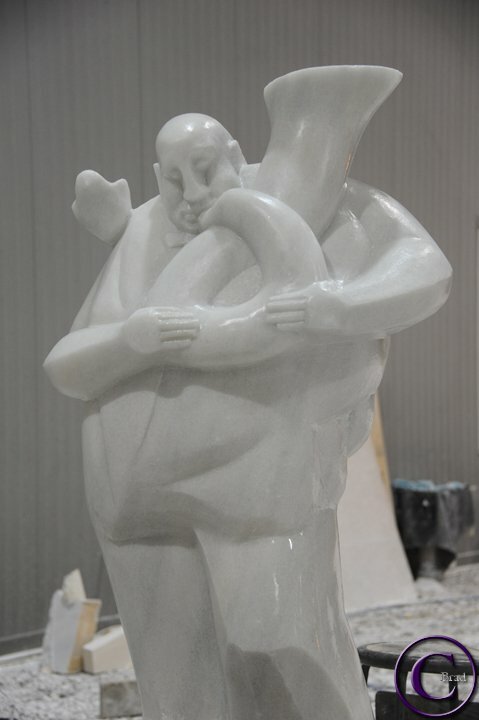 His objective with this sculpture was to create a feeling of lightness and movement from a heavy material. Well done!! There are many problems in the world that man has created such as wars, drugs, pollution and discrimination. Now the world is a smaller place and we interact more than ever, we aren't doing the best job of that. If everyone made a small change in how we treat the earth and each other, and we maintain that change, the world could be a better place. It doesn't need to be a big change, only a small one like the pearl of wisdom in the palm of the hand. 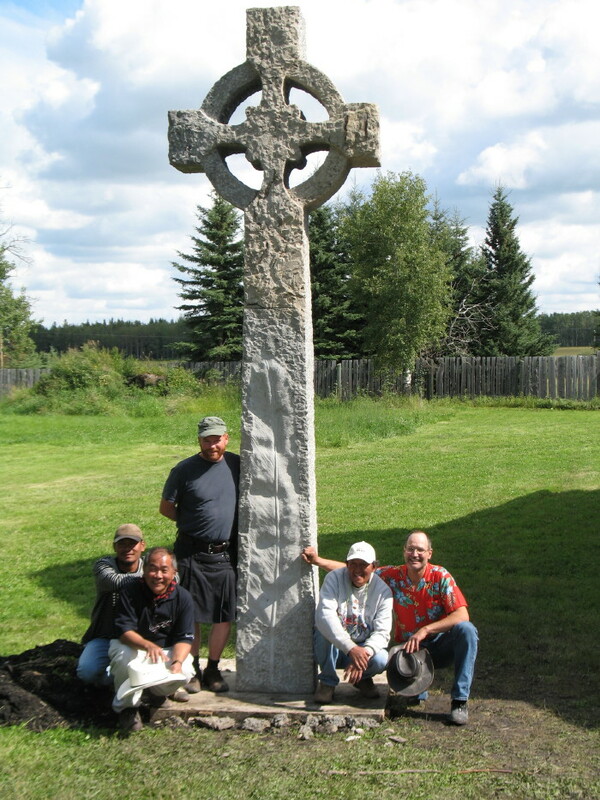 The stylized figure balanced on the top of the column represents a family. The largest form is the man, recessed in the man is a woman with hair flowing down her back. The negative space represents a baby. Hung's statement about this sculpture "Family is a good balance for your life." Three sea shells represent three moods of the sea: Peace, Tranquility and Turbulence. Paul wanted to create a sculpture that depicts the ancient culture of Canada and of Ireland. 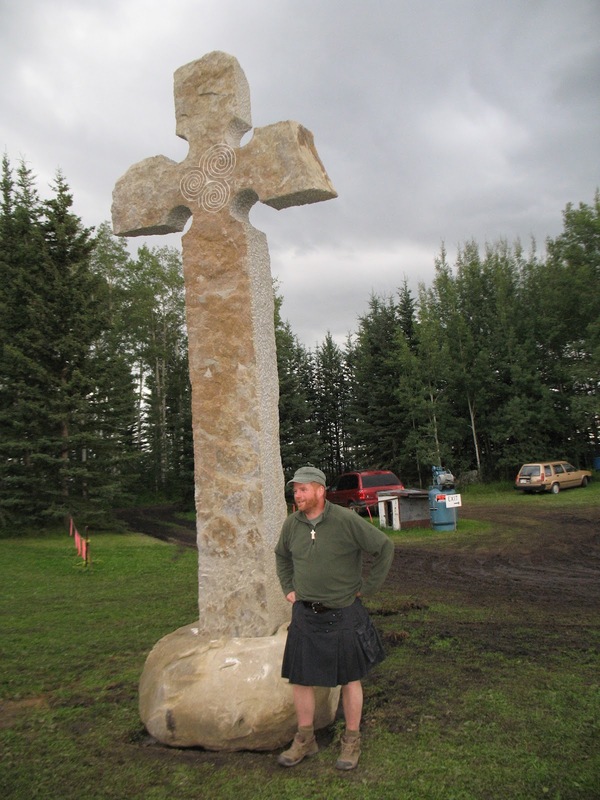 The celtic cross is, of course, the Irish element and the eagle feather carved on the shaft represents the ancient culture of Canada. 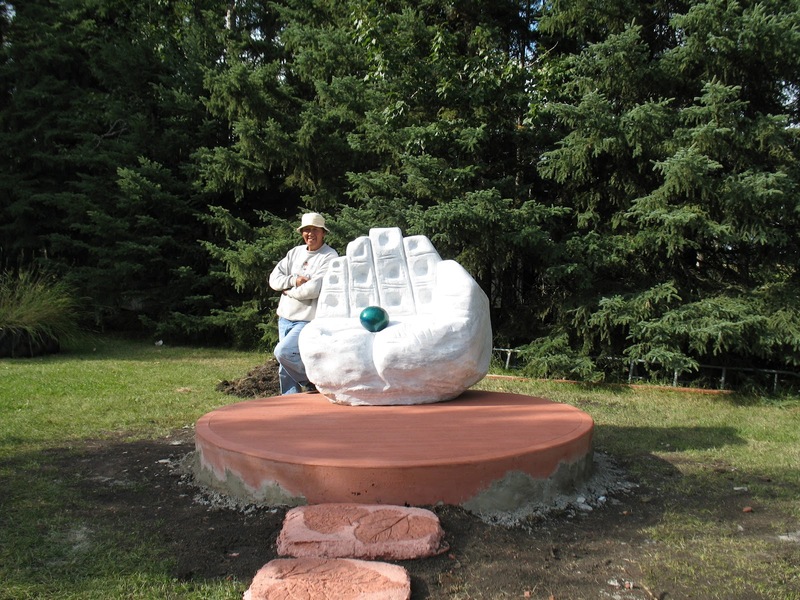 Chander Parkash from India created this sculpture a community temple. There are 1000's of these temples in India. Like our community playgrounds they are found in residential areas. The area around these temples is a sacred area and is suitable for someone to pray at when they must visit a temple. Community temples are non-denominational so regardless of your religion you can visit here to pray. 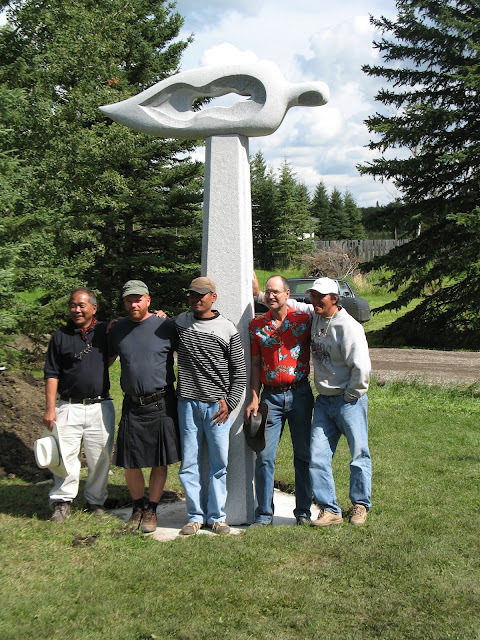 That feature makes the title of this sculpture especially significant, "The Gates to Heaven, Everyone Can Go". Sandstone and metal. In a predominately cubic style this sculpture depicts a couple sharing a kiss. 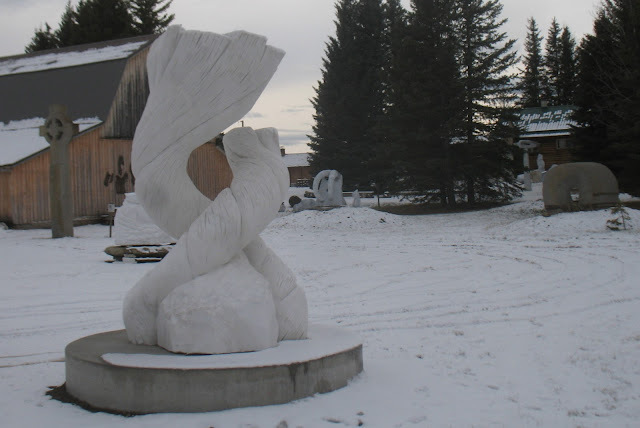 This sculpture is the first in a series of 4, Spring, Summer, Autumn and Winter. It depicts a flower in the spring that is ready to bloom and reproduce. It an also be viewed as the lower torso of a young lady, like the flower, ready to bloom and be fruitful. This feature of the sculpture is referred to as "dual representational". Canuk is a beautifully stylized Iriquois indian head. The style transitions from organic on the left (the face) to cubicon the right (the head dress) In addition to being a beautiful form this transition speaks to the transition of life in Canada since the Europeans came to Canada, transforming the way of life from living harmoniously with nature to the way we live now with a gridwork of roadways and predominately cubic building styles. The goat is an important animal in the Iranian culture, Mohamed chose to share it with us. The stylized goat with the dramatic horns is obviously the leader of the herd. The kid, his son, looks up at his father imagining the time when he will have the opportunity to look after and over the herd. 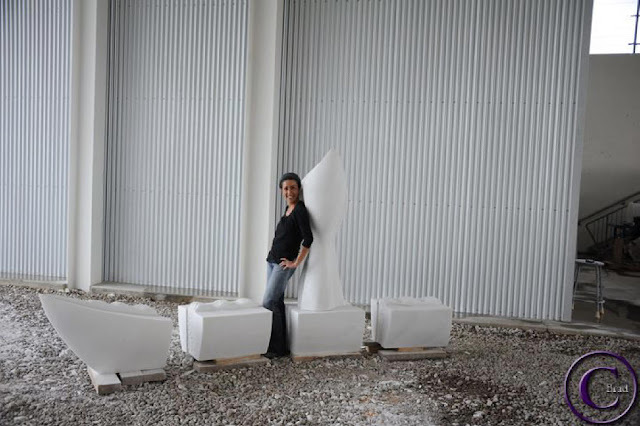 Bergen Rocks was the 45th international sculpture symposium for Tanja, her works are truly spread across the globe. She is very well known for her stylized torsos, and we are so glad to have one here in Canada. The base stone is much larger than the torso but carved in exactly the same form. You might look at the composition as a lady standing at the shore of a lake with her reflection visible in the water in front of her. "Rising Sun" is Peerapong's second sculpture in the park and was inspired by his time here at the first Bergn Rocks event. When he woke in the morning and came out to exercise on the lawn he would see the sun rising over the tree tops to the east between the two trees where this sculpture is placed. In his submission for the third Bergen Rocks he actually specified that if he was chosen to participate again this sculpture should be placed here. Cool that he would chose the location based on his memory of watching the sun rise each morning. "Repression" creates the illusion of a solid material actually being twisted by the pressure created by the cables and wires bending it. An analogy to life in our modern times and by some governments. The pressures of our lives may actually cause our will and character to be twisted. Chu did not intend for "Spring" to make statement or have an interpretation. It is simply an interesting form depicting something we are all familiar with. A jazz musician playing his instrument. Ebru's sculpture depicts her interpretation of a phoenix figure riding a boat that is meandering down a slow river....the journey of life. The segments of the boat include a representation of water adding continuity and an important element of life to the sculpture. Two ropes coming together into a knot. Uk says that the millions of fibres that would be inside these ropes represent the peoples of the world. We are all interacting more in these modern times now and when we figure out how to do it properly, with respect for each other the knot will come together. We will have made the right connection. Two horses standing together on windy day on the steppes of Mongolia. A beautiful sculpture that captures the wind in the blowing manes and tails of the horses. Small birds are flying out of the bushes that the horses are standing amongst. That's great thing in life you and your friends bring for young generation in future. "Fear no Art"